The scent of grand and humbling mosaics, haunting pipe organ notes, polished pews, smoldering resins and reverence. Smokey galbanum essential oil dissipates quickly after initial application leading into a rich dose of sweet, sticky labdanum resin. Crystals of frankincense illuminated in eerie multicolored light streaming through vintage stained glass windows emerges from the labdanum followed by exquisite polished rosewood and a combination of dark myrrh, soft exotic woods, a waft of heavenly vanilla and fragrant ashes. A juxtaposition of dark resins and light golden balsamic and sweet vanilla notes, a metaphorical interpretation of a timeless inspiration. 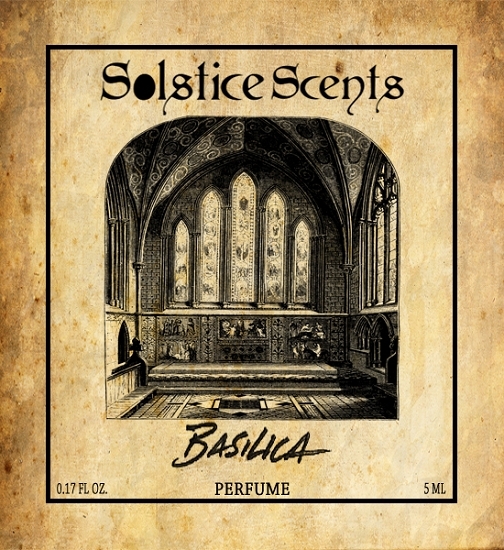 Basilica is comprised of a rich labdanum absolute which smells of sweet, balsamic golden amber, vanilla, essential oils of frankincense, bright rosewood, myrrh, peru balsam, cistus, sandalwood, a few drops of galbanum and cedarwood. Basilica is very resinous and dry with sweet elements, a definite morpher. The scent hugs intimately close to the skin on the dry down, but smells...divine.